There are a ton of wreath making tutorials on the web, so feel free to follow a different one if you want to use a pre-made wreath form. When I went to Joann, they only had the little ones in stock, and since I didn't want to search all over town or spend any more money than necessary, I decided to make one out of cardboard instead. 3. Using scissors or a box cutter, follow your guidelines to cut out 2 cardboard "donuts." 4. Securely tie a string (or wire) around one "donut" for hanging your wreath when it's done. 5. Glue the two "donuts" together. For added stability, I made sure one "donut" had the cardboard channels going vertically, and the other running horizontally (see the photo with the string above). 6. 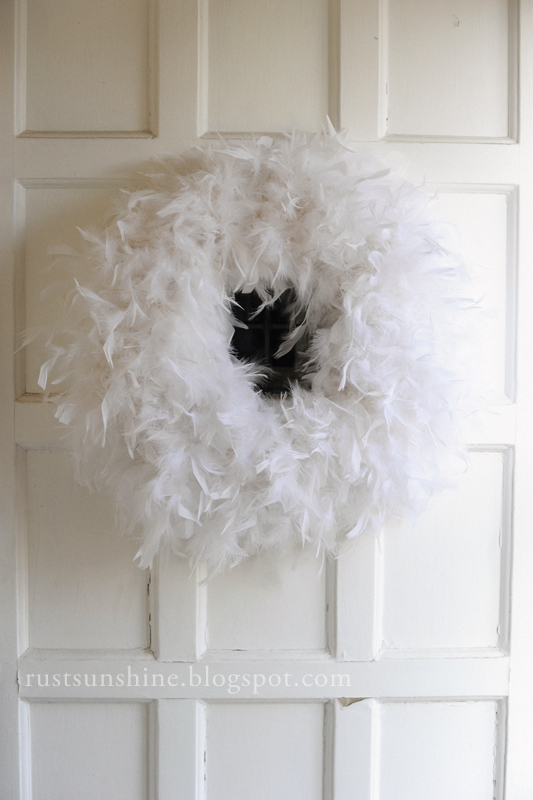 After the two pieces are glued together, hot glue one end of a feather boa to the back of your cardboard wreath. 7. Wrap the boa around the wreath, passing it through the middle and around the outer edge until you get to the other end of your boa. (One boa should cover roughly 1/2 of the wreath.) Push the boa loops closer together or spread them apart a bit as needed, and hot glue the end in place. Repeat with the second boa. 8. Tie a loop with the string you attached in step 4, or run a ribbon behind the string, and hang it up! Love this! Feathers are so hot right now!! I love this! I love the idea of using cardboard frames too because Michaels is always sold out of them this time of year. I wonder where I'll fins boa's? I'm going to go out today, so wish me luck! I'd check craft, fabric, or party stores. Good luck! No luck today. I've another place that I'll stop on my way home from work tomorrow.